So, home stretch now but some fierce battles to be fought first. I’ve been enjoying this trilogy, not as much magic as Rogue but enough to keep things interesting, and to take the story in the right directions. I adored Rogue – the books and the character – and its hard to follow up that with another trilogy. This trio has a very different feel to it – its got the magic connection, but focuses on the princesses as individuals. How they’ve changed – or my perception of them has changed – from the first novel. There they seemed so innocent in many ways, Ami, sweet and pretty but kind of vacuous in personality and focussed on the fairy-tale ending for princesses, Andi, tomboy, very uninterested in political machinations, just wanting to go out in the countryside and be with her beloved animals, and Ursula the Heir, brought up to reign after her King, and to put everyone and everything above her own needs. 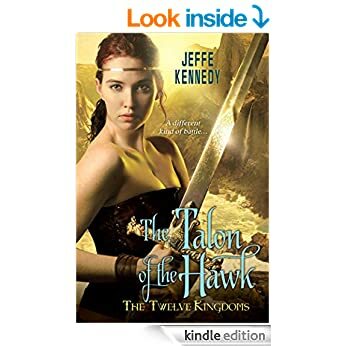 Now Ami has gained strength and a new love, and become someone who knows she has a place and a duty to uphold, Andi has found love with King Rafe and is fiercely protective of her people and Ursula – she’s trying her best to do what her King commands as ever, but its become tougher with his weird actions. I’ve enjoyed the growth in the girls, love the way they’ve changed and found love. The story now brings the three back together and they find they can finally recognise each others strengths and support each other as their mother hoped. Her messages to them have been very cryptic and mystical, and have led them very close to disaster at times. The trouble with trying to foretell the future and help her daughters is that its fluid, it changes so she could only give them tools to fight what she could see. Poor Ursula, she has a hard row to hoe here, struggling with her duty when it goes against her Kings commands. Fortunately the leader of the mercenaries her father has purchased proves to be a great source of support – being Ursula though can she learn to trust him, his help is essential but she’s un-used to support, she’s always been the support for others, needing none herself. this time though if they are to retrieve Ami’s baby daughter and save the Kingdoms they need to work closely and rely on each other for support. There are some real shocks revealed finally, and I so felt for Ursula when certain things come out. The witch – its easy to see what she wants and yet their father seems entranced by her- something that proves all too true, and of course witchcraft and witches are hard enemies to have. This one is a particularly difficult enemy, having roots in Dark magic…they need all the help their mother has left them if peace is to reign.